Above: A plot of a series of 100 random numbers concealing a sinefunction. Below: The sine function revealed in a correlogram produced by autocorrelation. 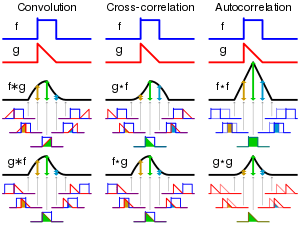 Visual comparison of convolution, cross-correlation and autocorrelation. Autocorrelation, also known as serial correlation, is the cross-correlation of a signal with itself. Informally, it is the similarity between observations as a function of the time lag between them. It is a mathematical tool for finding repeating patterns, such as the presence of a periodic signal obscured by noise, or identifying the missing fundamental frequency in a signal implied by itsharmonic frequencies. It is often used in signal processing for analyzing functions or series of values, such as time domain signals. Different fields of study define autocorrelation differently, and not all of these definitions are equivalent. In some fields, the term is used interchangeably withautocovariance. where “E” is the expected value operator. Note that this expression is not well-defined for all time series or processes, because the variance may be zero (for a constant process) or infinite. If the function R is well-defined, its value must lie in the range [−1, 1], with 1 indicating perfect correlation and −1 indicating perfect anti-correlation. 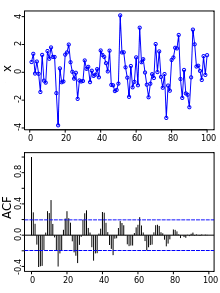 It is common practice in some disciplines, other than statistics and time series analysis, to drop the normalization by σ2 and use the term “autocorrelation” interchangeably with “autocovariance”. However, the normalization is important both because the interpretation of the autocorrelation as a correlation provides a scale-free measure of the strength of statistical dependence, and because the normalization has an effect on the statistical properties of the estimated autocorrelations. In signal processing, the above definition is often used without the normalization, that is, without subtracting the mean and dividing by the variance. When the autocorrelation function is normalized by mean and variance, it is sometimes referred to as the autocorrelation coefficient. Given a signal , the continuous autocorrelation is most often defined as the continuous cross-correlation integral of with itself, at lag . where represents the complex conjugate, is a function which manipulates the function and is defined as and represents convolution. For a real function, . Note that the parameter in the integral is a dummy variable and is only necessary to calculate the integral. It has no specific meaning. For processes that are not stationary, these will also be functions of , or . These definitions have the advantage that they give sensible well-defined single-parameter results for periodic functions, even when those functions are not the output of stationary ergodic processes. When mean values are subtracted from signals before computing an autocorrelation function, the resulting function is usually called an auto-covariance function.